Three managers from Bolivia's state-owned mining company were taken hostage by residents of a village in the region of Potusi, who are demanding a 15% stake in the region's silver mine part-owned and operated by Glencore. The three were later released La Razon reports. Commodities giant Glencore operates and holds a 45% stake in the Potusi mine and four others in the South American nation under an August deal with Comibol, which owns the remaining 55%. Glencore's Sinchi Wayra subsidiary in Bolivia were outright owners of the five mines, but after about 1,000 miners seized control of the Swiss-based company's flagship Colquiri silver and tin mining operations following violent clashes a new "partnership agreement" was signed. 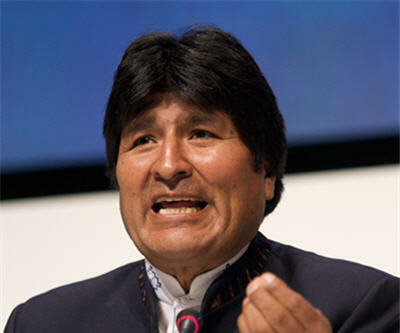 Bolivia has nationalized a string of assets in the energy and mining industries since President Evo Morales (pictured) took office in 2006 including Glencore's zinc and antimony smelters which prompted the company to suspend any new investment in the country.